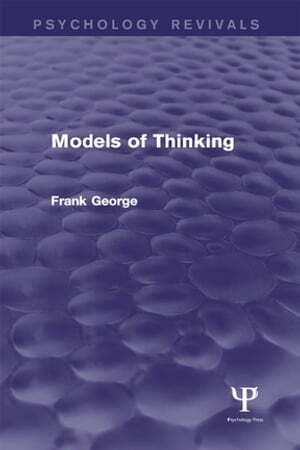 Collins Booksellers - Models of Thinking by Frank H. George, 9781317418450. Buy this book online. In this volume, originally published in 1970, an attempt is made to examine the more logical aspects of thinking, such as the ability to abstract and the manner in which concepts develop. The author describes the features that had long been regarded as central to thinking by experimental and theoretical psychologists of the time and he places more emphasis on the part played by language in cognitive activity. In the second part the author points out how such basic features of thinking as concept and hypothesis formation, inference making and the use of ordinary English are essentially things that can be carried out by a computer. His use of theories and his methods of modelling the human brain and the way it works comprise an intriguing and highly sophisticated attempt to provide an appropriate framework in which problems of thinking can be studied. Professor George was the author of several books, the best known of which at the time were The Brain as a Computer and Cybernetics and Biology. His writings covered many aspects of psychology, philosophy and logic, as well as cybernetics. At the time of original publication he was Professor of Cybernetics at Brunel University and Chairman of the Bureau of Information Science.